The thing I love about coming here, is that I don’t need to explain why my dining room looks different every week. (Yours probably does too.) It’s just what we do. This is the reveal of the dining room. But first, I thought you might like to see where the room started. I show you these photos even though I don’t think they look that great to be transparent, and to encourage you. When I started blogging, my dining room looked like this, pretty much. This was at our old city house. Looks a bit unbalanced to me, and it did at the time, but the space was small, and I just hadn’t gotten to it yet. I know you know what I mean. The room was ‘on my list.’ It takes time to get your home just the way you want it. 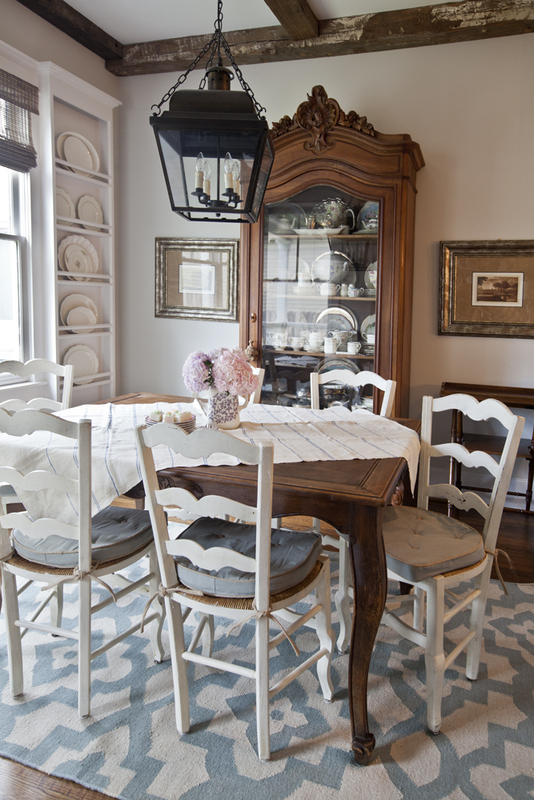 At some point I found these vintage French dining room chairs at the auction house and the transformation began. The chairs breathed new life into the room, and I couldn’t believe what a difference they made. I decided I would focus my attention here and keep the momentum going. The chicken wire photo thingy on the wall, can be found here. I knew the armoire, although gorgeous, did not work on this wall. I found a console at Restoration Hardware (on clearance) and the room evolved some more. I also added a vintage mirror from Round Top that I painted. Then we moved from the suburbs smack dam into the heart of the city. Here the dining room is a bit bigger. I brought pretty much what was in the old dining room into the new one. But it was still a bit bare. The walls at th old house were painted Sherwin Williams Bittersweet Stem, while the new house is painted Sherwin Williams Agreeable Gray. I made slipcovers for the chairs, which made my guests a bit happier to have a seat cushion, and they gave the room a bit of softness. Next came curtains, bamboo shades, and a rug. I decided the table didn’t work any more, but tried to make it work. I used a tablecloth to disguise it. Which brings me to the latest phase of my room. I just replaced the table with a new one from Restoration Hardware. Am I ‘done’? Of course not!! This is fun for me, rearranging and redoing. It’s the circle of life if you will. I am sure I will make more changes. But I always try to keep an eye on the budget. BTW, when I sold the old table, I made enough money to buy the new one. The old chairs were sold for way more than what the new chairs cost. 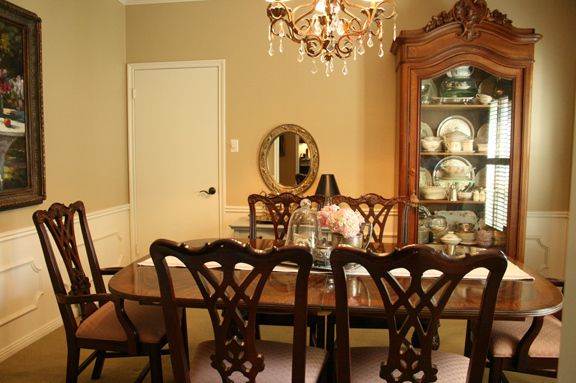 The armoire in the original photo got moved to my breakfast room. I mean look at that table leg and you will see why I really thought it would be perfect in the dining room. The lamps from the console at the old house have been incorporated in another room. The new lamps actually came from the living room. I love to shop my house!! I figure if I get tired of something I will give it away or sell it. I have several items in my garage, and they will be finding new homes soon. My rule is that if I am not using it, it has to go. And so several things I still liked were given away, because I didn’t want them gathering dust in my garage. I love passing things along to other people. So what have I learned along the way? 1. It’s okay to constantly change your room. Even if your husband thinks you are crazy, I know you are NOT. This is normal for us. 2. Take your time decorating a room. If you are spending a good bit of money, I think it makes sense to change the room slowly to pace your spending. Also if you take your time, you can take advantage of sales along the way. Rooms just evolve over time, it doesn’t have to all be done this week. 3. Enjoy the journey. If you celebrate each little improvement to a room, you can enjoy it as it is transformed. If you decide you won’t be happy until the room is perfect, then you are setting yourself up for unhappiness. 4. Try giving things away. I sell a lot of my old things, but I also try to give a good bit away to people who can’t afford to buy the stuff. Here’s the thing. If you give things away, it is SO. MUCH. FUN. It may sound cliche, but it’s true. I wish I had known this when I was younger. Maybe you have known this all of your life, but just didn’t bother telling me. That’s why I’m putting this out there, in case someone doesn’t know. Seriously try this one, if you haven’t already. What are your tips for decorating a room? I love, love, love your new dining table. It is perfect for your dining room which is so pretty. I am in the process of looking for a new table for our breakfast room. Thanks for the inspiration! I love seeing all the changes you’ve made. I must, admit by the end, I was wondering how you could afford all the changes. Then you explained it! I agree about giving things away. We downsized and gave away so much. Just last week I contacted a young friend about some special Christmas decorations that she wants. I also want to tell you that I have learned to shop our new, much smaller house as well. My daughter decided that she was ready for a chair her grandpa had promised her that fit perfectly in our living room. I graciously (not really, I was bummed.) took it to her yesterday. I was determined not to buy a replacement, so I realized that my scrapbooking chair – where I never sit – would also fit perfectly in that vacant space. Thanks for all your tips. Your dining room is beautiful. And the armoire is absolutely amazing. I have never seen one this pretty. Love what you are doing in your dining room. Very impressed that you made the slips for your chairs. Can you tell me where you got your chandelier from?? I “need” one for our dining room. It looks fabulous, Anita and you know I am right there with you changing things up. Ohhhh, so beautiful. We have downsized into a condo and I dream of a beautiful dining room again. Our “breakfast area” (not even a room) is so small I just can’t find anything right for it. 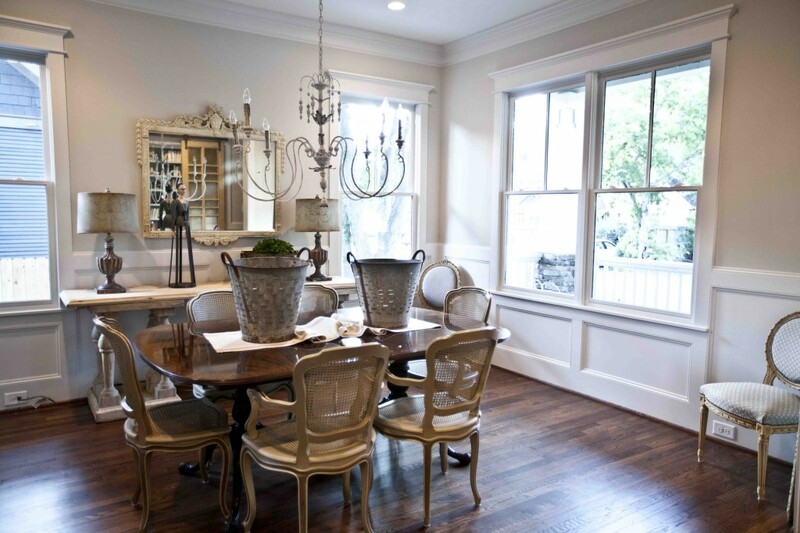 Your dining room has evolved into an inviting (while still gorgeous) environment. I am totally enamored. Everything has come together and I love it now. It doesn’t look as “heavy” with the lighter colors. I love when a plan comes together. Love the new dining room! Where/how do you sell “good” stuff like your table and chairs and get anything for it? I have a similar table and want one similar to your new one. Lynn, I sold the chairs on Craigslist and the table at a local consignment store. And yes… things do change around here…. a lot! But it’s what we do.I luv that the home is decorated in a way that things can move, flow from room to room. So I too shop the house a lot. I mean even if I could afford to buy new all the time, things with soul attract me even more. Change is also a growth in a direction of knowledge. Getting to know certain design factors and ones ever changing personal taste. 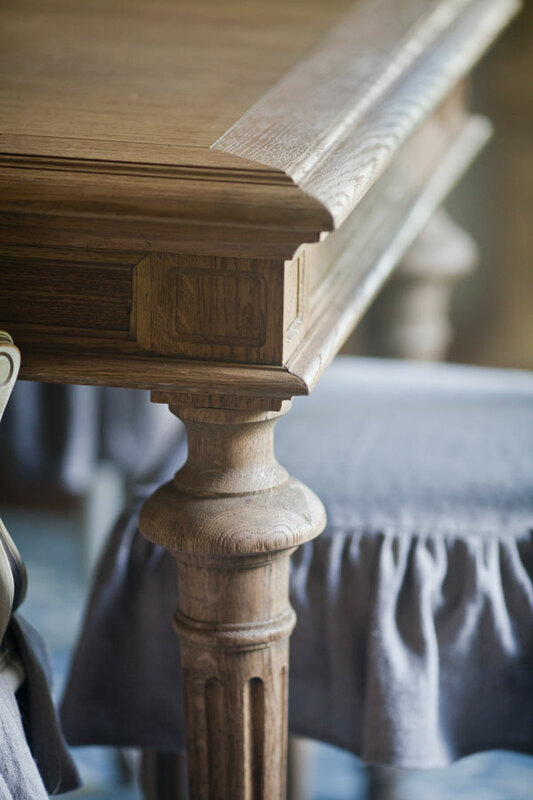 It’s a fact that we all who visit love your design style, and the fact that you have anchored the room with pieces of old make it that much more inviting. I have a friend who changes her rooms sometimes twice a week, always moving something in out our or around. 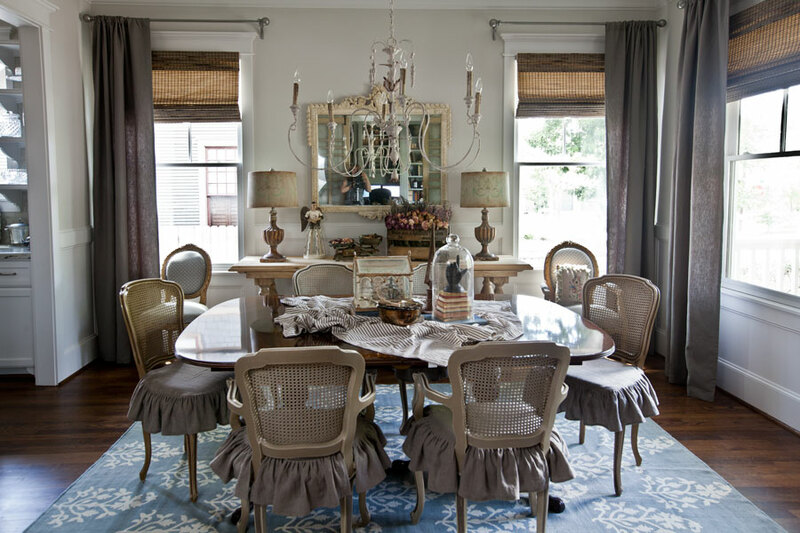 One of my most favorite looks she did to the most perfect dinning area was she angled the dinning table from a corner of a room making the table kiddy cornered in the room, it added whimsy, yet a real presents to a dinning statement. 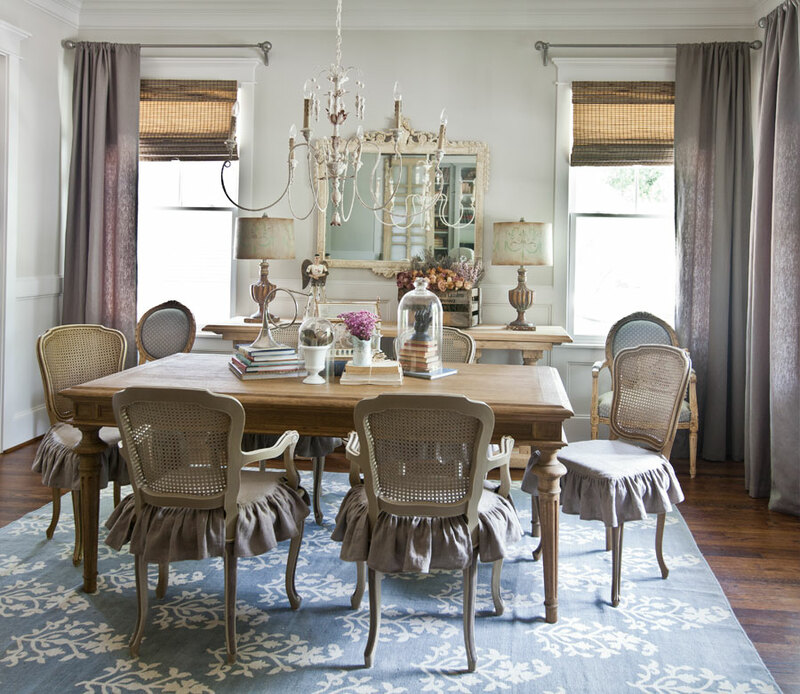 Her furnishing were all antiques from France and had a rich FarmHouse feel. I am in our small investment home, ready for another move and looks like we will be here a bit longer. With the rooms all sized oddly it’s doesn’t leave much room from change, that’s why something leaves in our home and something moves in to take its place. My last home my iron bed was able to sit in the middle of the room and float with grand appeal where pieces filled the rooms walls simple stated. I had the best compliments when ones visited, of course outlets for plugging in lamps were able to run and hide under pieces without foot traffic concern. It had a very clean simple feel and I loved the romance it gave the room in a rustic feel. So to say one loves to experiment with designs over her is an understatement. You my friend, has awakened my day with looking to see what I can move around. Or gut a closet to arrange it for a sitting nook, reading, or library. See you soon and your home of living. Dore you have a gorgeous home. Hang in there. We were in our last home 22 years. I was so ready to move for years and hated to invest a lot of money in the home, since I didn’t figure we would get it back. I know you will do something gorgeous with your home. Your work is beautiful, absolutely beautiful, and you are so right on so many levels! I believe that rooms take on a life of their own as a house becomes a home, and they continue to change as the people who live in them do. Shopping at home satisfies me (and my husband) because I know I’ve made a good decision when I’m able to use what I’ve already purchased in different rooms and/or various ways. And most importantly, sharing my finds with family, friends, and those in need brings me personal joy and puts smiles on the faces of others; it’s a win-win for all! Vickie I love shopping my house. I love your dining room. The gray walls are so fresh and neutral. I am wondering though, what did you do with your original dining room chairs. They are gorgeous! If you gave them away, I’m immediately jealous and wish I knew you better! As usual, you have beautiful taste and do a wonderful job styling your rooms. Kim I sold those on Craigslist, and did rather well on the sale!! I love how the pictures document the evolution and in every stage the room is elegant. But not a word about the lovely chandelier? Oh Barbara, it is from Horchow. Ooooh! Your home is soooo lovely!!! I really admire how you’ve gone step by step to a wonderful reality! Your colors are so soft and so are the furnishings. I like that much more than the “hard” colors of so much wood. Although, small glimpses of wood mixed with softer colors is very flattering. You’ve done a remarkable job, especially keeping an eye on the budget! Thank you Tess. I think that is the look I am going for, a soft look. Every time I visit your blog I am immediately inspired to tackle another room! Your dining room is GORGEOUS!!!! 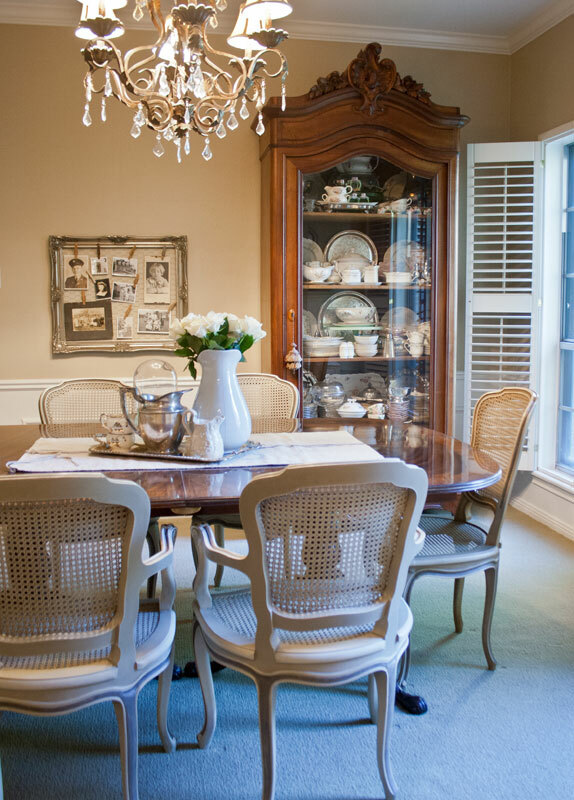 I swear we have the same decorating ideas, not only did we purchase and paint the same clock from J&M~ I as well have the same style chairs and slips for my dining chairs and with the exact same chandelier! I paired my chairs with a chunky style farmers table. I love the table you chose it immediately adds grace and elegance. Thank you so much for sharing your beautiful home with all of us!!!! It’s absolutely beautiful! I’ve loved seeing the changes, every step of the way! The room has come together beautifully. It looks much lighter and fresher with the lighter wood chairs. 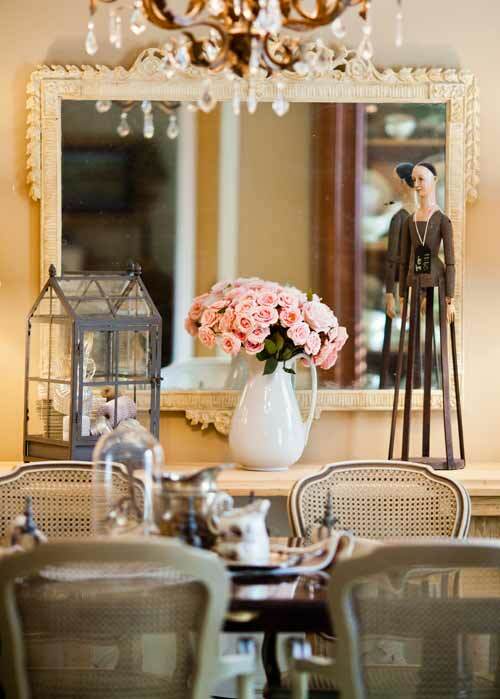 You have made a lovely job of the styling, lighting and making the room come alive. 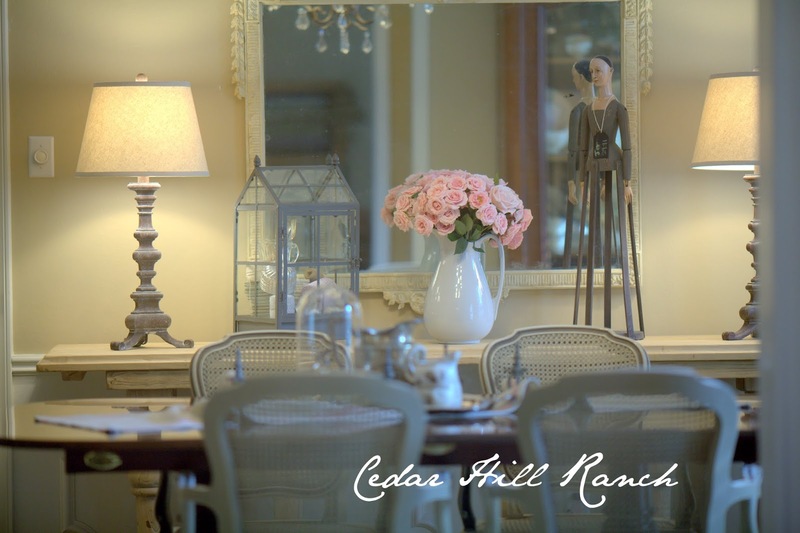 I am sure your friends and family won’t want to leave the table sitting in such pretty, relaxed surroundings. I definitely agree a room should evolve over time. Sometimes you really have to get a feel for a house or a room before you decide which direction to go in it. I am printing out your #1, highlighting it and showing it to my husband! He thinks when a room is decorated, it has to stay that way forever. 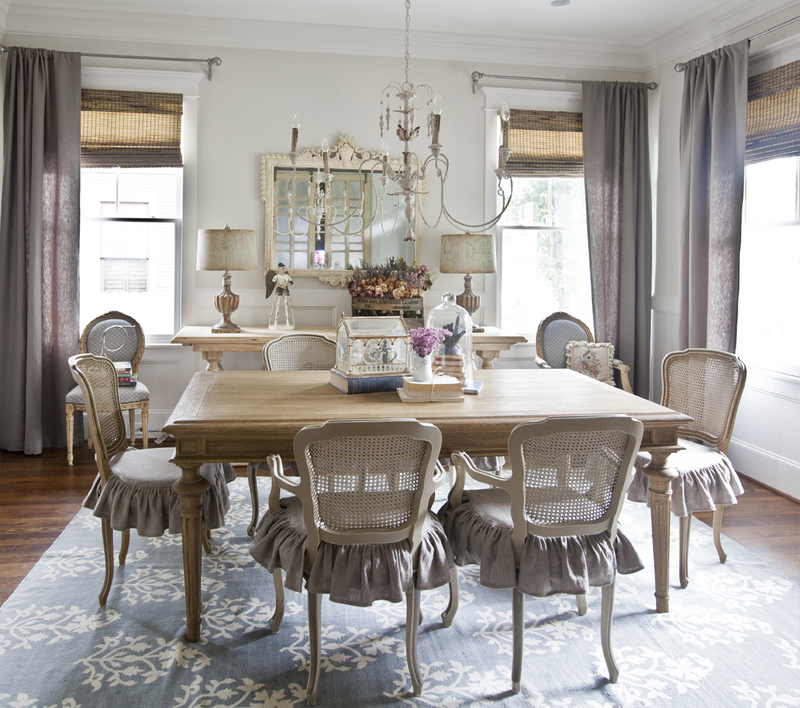 The dining room room rug is from Ballard Designs, and the breakfast room rug is from Birch Lane. Bea-U-tifully done. Just in time for a lovely Thanksgiving meal. WELL DONE,Darlin,WELL DONE. Simply gorgeous, Anita. I love to see the process of decorating until the final reveal. French and ooh la la! I love the dining room. I love all of your rooms. And, I really love being the recipient of many of the “give aways”! What a blessing you have been to me – in more ways than beautiful items. I thank God for you my sweet friend. Ah Peggy, you bless me so many ways!!! I get serious inspiration from you. Your taste is just dreamy & perfect. Sonia, you are so sweet!! 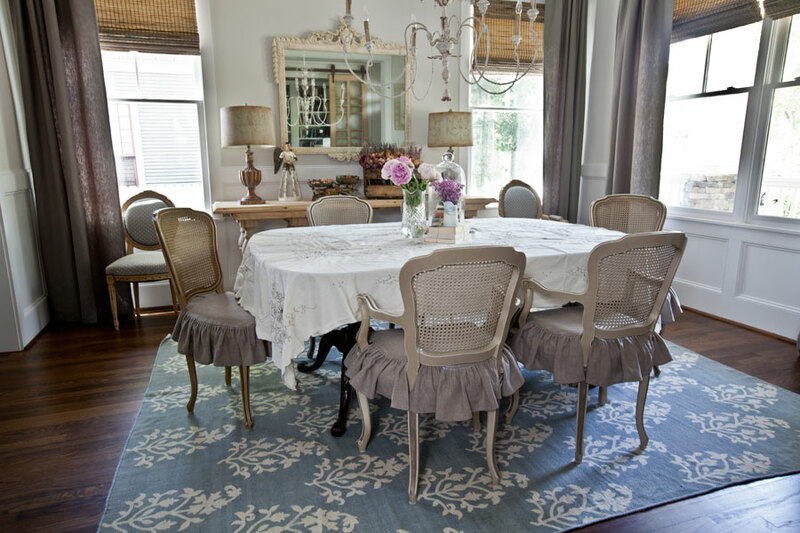 Your new table is gorgeous and perfect for the dining room. I love the look of the aged wood, not too dark or too light. You must be really happy. Choosing the right wood is so difficult, I am going through that for my bedside tables at the moment. It’s a wonderful and comfy looking room. You did a great job. Ha, ha, Teresa. Come see me! Your style is perfect as always. I have stlye but difficulty accessorizing/vignettes. Working on improvements in that area. I love your dining room, it is beautiful! The new table lightens up the room and goes so well with the other colors. You did a great job! Thank you Terry. I agree.